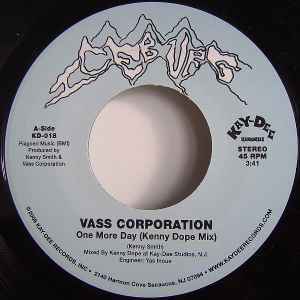 Vass Corporation is one prime example of an obscure group tied to Cincy soul veteran Kenny Smith. The groups only two known recordings, originally intended to be a single in their day – see their first release here some 35 yrs late. Collector and local music historian Chris Burgan teams up with Kay-Dee Records, for this first 45 in the new Iceburg series, an imprint focused on shadowy treasure from the Queen City. Chris pokes around in the dark with a flashlight, and Kenny Dope comes in like EMS, breathing life and back into these buried bodies, additionally giving them a good shock with his peerless re-mixillator.“One More Day” is up-tempo funky soul – with a huge break leading into a fit group vocal call and response. The B-side, a ballad: “All The Love We Lost,”delivers sorrow over heavy drums. Kay-Dee Records is proud to present this belated but much deserving first issue.